In 1933, the NSDAP became the government of Germany: the following are some of the key changes implemented by the Nazis that affected the Jewish community of Themar. January 30: Hitler becomes Chancellor of Germany. March 5: Reichstag Elections. Nazis gain 44% of the vote nationally. The pro-NSDAP vote in Thüringen is 37%. April 1: Boycott of Jewish businesses throughout Germany. April 7: The Nazi government passes the Law for the Restoration of the Professional Civil Service, which excludes Jews and political opponents from university and governmental positions. In the following weeks, similar laws affect Jewish lawyers, judges, doctors, and teachers. The first victim of this law in Themar was Moritz Levinstein who taught at the Themar public school as well as being the religious leader of the Themar Jewish community. He received his letter of dismissal in July 1933. 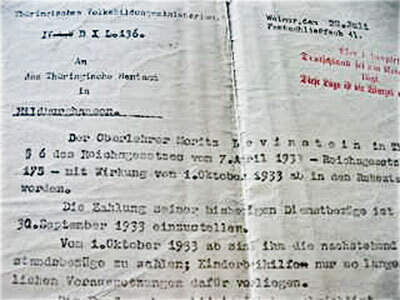 September 15: The Nazi government decree the Reich Citizenship Lawand the Law for the Protection of the German Blood and Honor. These Nuremberg “racial laws” make Jews second-class citizens. They prohibit sexual relations and intermarriage between Jews and “persons of German or related blood. By the end of 1935, the number of Jews living in Themar has dropped by about 25%, to 71. Young men such as Albert Wolf, son of Heinrich (1882-1915) and Frieda Wolf (née Mayer) and his cousin, Heinrich Levinstein, son of Moritz and Nanett Levinstein (née Mayer), had left Germany by 1935. Albert would return as an American soldier. The manifest of the ‘Bremen,’ the ship on which 20-year old Albert Wolf sailed for America on March 23rd, 1934. He had aunts and uncles living in New York City. May 5: A site near Weimar is chosen for a new concentration camp. July 16: The first 300 prisoners arrive in “Konzentrationslager Ettersberg.” Soon, there were 1,000 inmates in the camp. Many were transfers from the Lichtenburg camp, 215 km. to the northeast of Leipzig. August 6: The name of the camp is changed to “Konzentrationslager Buchenwald” (Buchenwald Concentration Camp). Buchenwald lies 125 km. northeast of Themar. The prisoners were used as forced labour to build the camp. 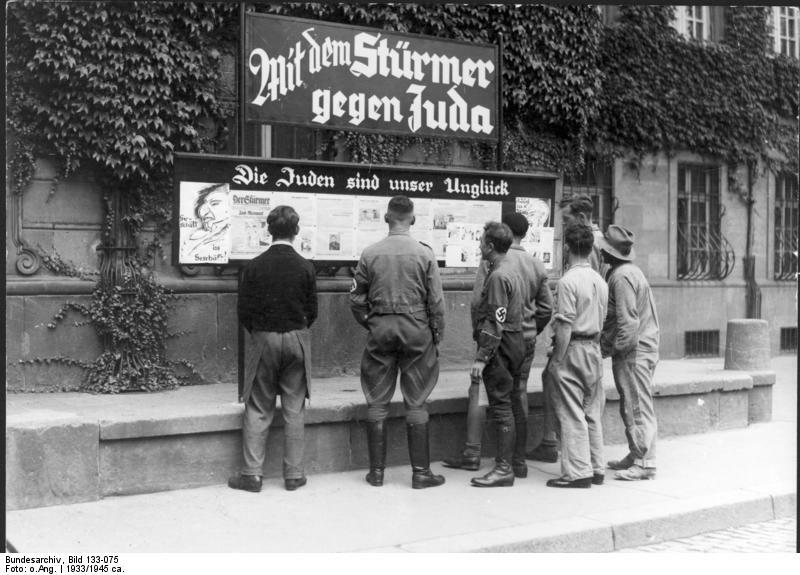 September 13: Himmler issues an administrative order allowing Jews to be released from detention on the condition that they emigrate from Germany. October 21: Himmler issues an order stipulating the arrest and confinement in a concentration camp of any German emigre who re-immigrated. Emigres were defined as persons who left Germany after the Nazi accession on January 30, 1933. March 3: A ‘census’ of the Jewish community of Themar counts 48 members; the leader is Ernst Gassenheimer. June 14: The German Ministry of the Interior requires registration of all Jewish-owned enterprises. In Themar this applied to the Gassenheimers, Moritz Sachs, S.J. Baer (Selma Stern), the Grünbaums, and the family of Max Müller I.
June 15: German Criminal Police officials arrest around 9,000 so-called asocials and convicted criminals in the so-called “Operation Work Shy, Reich” (Aktion “Arbeitsscheue Reich”), and send them to concentration camps. Among those arrested are approximately 1,000 Jews. This is the first mass arrest of Jews in Nazi Germany. In Themar, two men, Louis Sander and Max Steindler, were rounded up and sent from Themar. Louis was not released until October 1938 and was almost immediately rearrested in the November Pogrom. Paul Rosengarten, who had moved from Themar to Meiningen in 1936, was arrested and sent from there to Buchenwald. He was released in August and sent home on a stretcher. He and Max Steindler were both rearrested in the November Pogrom. November 9/10 — “Reichspogromnacht,” called “Kristallnacht” [Night of Crystal] by the Nazis. The events in Themar are described here. Ancestry.com. California Passenger and Crew Lists, 1893-1957 [database on-line]. Provo, UT, USA: Ancestry.com Operations Inc, 2008. Das Bundesarchiv, Gedenkbuch: Opfer der Verfolgung der Juden unter der nationalsozialistischen Gewaltherrschaft in Deutschland 1933-1945.